The beach is located only 150 meters from La Quebrada and from our terraces and balconies you can get a seaview. Our neighborhood enjoys a superb peace and quiet, its ideal for total relaxation. Cozy rooms range from double, twin, triple, family to quadruple rooms, each with private bathroom with hot water and private balcony or terrace, several of them overlooking the sea and a dry river delta. 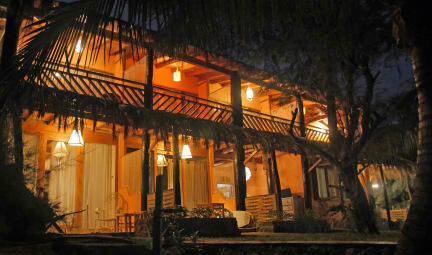 On the first floor, we have a room with TV and cable, and a beautiful garden full of palms and native trees like carob. La Quebrada has wireless internet (Wi-Fi) for laptops and personal computers free for guests. We organize surf trips to different beaches of the area as Lobitos, Cabo Blanco and some points secrets of northern Peru.